Below are multiple street changes being made along W. Trade St. between Rozzelles Ferry Rd. / W. 5th St. and College St. Please use the information below to help plan your route and move safely through these closure areas. W. Trade St. between Graham and Pine will be closed beginning Friday, November 16, 2018 at 7:00 PM and will re-open Saturday, November 17, 2018 at 7:00 AM. This closure is necessary for relocating the Windscreen Sculpture currently located at Pine / Trade and being relocated to Johnson & Wales Way / Trade. Wesley Heights at W. Trade St. will be closed beginning Monday, November 26, 2018 at 9:00 AM and will re-open Monday, December 10, 2018 at 6:00 AM. This closure is necessary for storm drainage installation related to the Gold Line Phase 2 Project. W. 6th St. between Graham and W. 5th St. will be closed beginning Friday, November 16, 2018 to Monday, November 19, 2018. This closure is necessary for bridge demolition related to the Charlotte Gateway Station. South Side of Cedar / Trade Intersection will re-open Monday, November 19th at 6:00 AM.. Eastbound W. Trade St. between Cedar and Graham will remain closed until Monday, January 7, 2019 at 6:00 AM. Westbound W. Trade St. between Cedar and the Norfolk Southern R/R bridge will become two way traffic for local access ONLY to access the Gateway Village Parking Deck. W. Trade St. between the Double Tree Driveway and Cedar will remain closed until Monday, January 7, 2019 at 6:00 AM. 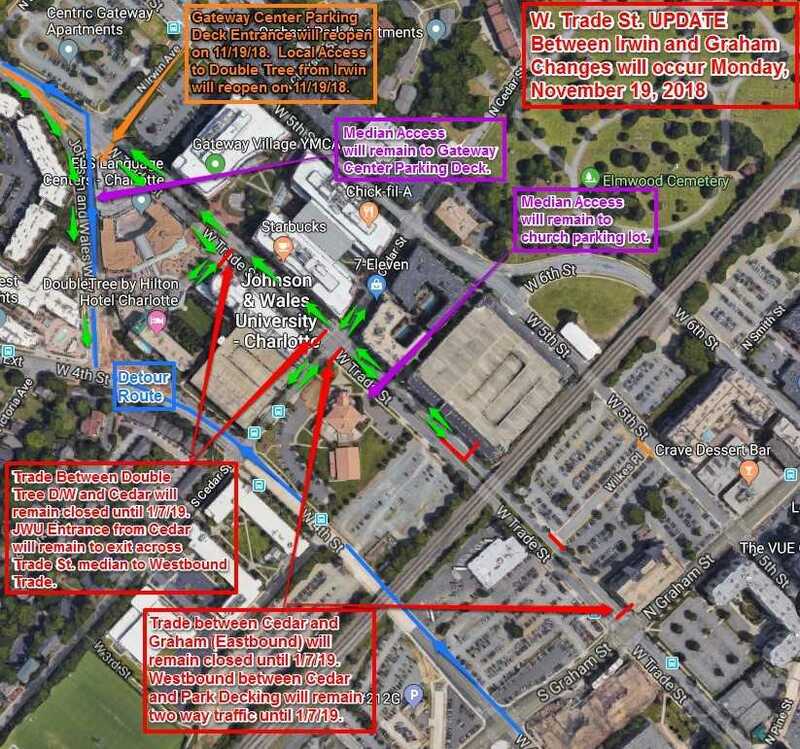 General Note: See map below entitled W. Trade St. Update between Irwin and Graham. No on street parking permitted. 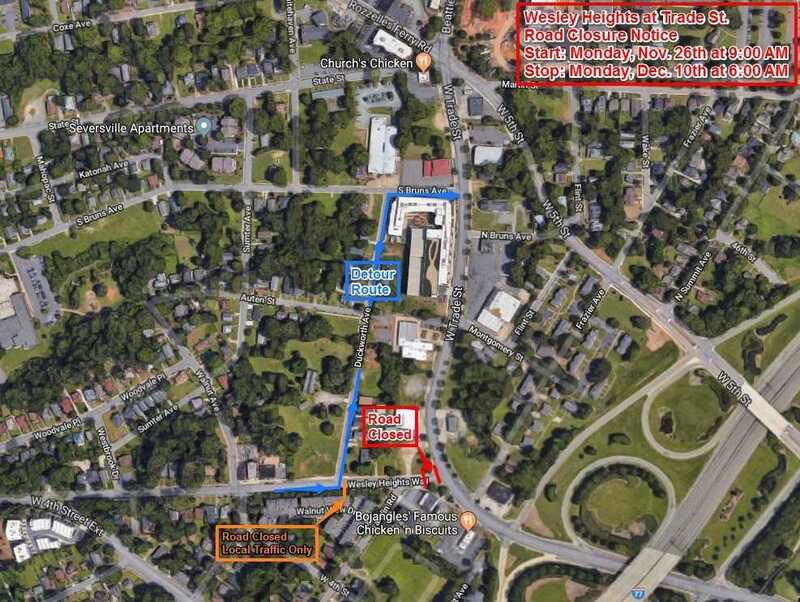 1) To access the parking deck entrance off W. Trade St. enter from W. 5th St. down Irwin Ave. and take a left on W. Trade St. / Exit toward Double Tree Driveway on W. Trade St. and do a u-turn to head back toward Irwin. 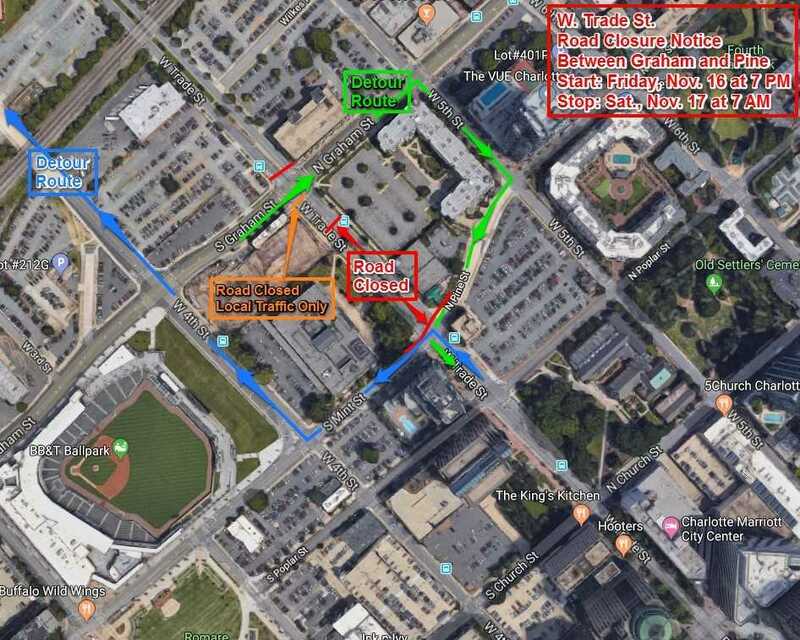 -Enter from W. 4th St. / Exit toward W. Trade St.
-Enter from I-77, Right on Johnson & Wales Way, Left into Parking Deck through a median break. Enter from Cedar St. in Westbound Lanes (The Westbound Lanes will be two way traffic) / Exit toward Cedar St. Greater Mount Moriah Church Parking Entrance off W. Trade St.
Exit toward Graham St. via Eastbound W. Trade St.
All other businesses located between Cedar and Graham enter / exit from W. 5th St. or W. 4th St.